On Sunday, November 11, 2018, the Presidio Trust and the National Park Service, along with members of the 9th and 10th (Horse) Cavalry Association, will pay tribute to veterans, the legacy of the Buffalo Soldiers, and their service to the country. The service of Ranger Frederik “Rik” Penn will also be honored, as he leads his final historic Buffalo Soldiers walk from the Presidio Officers’ Club to the San Francisco National Cemetery. After 25 years of distinguished service, Ranger Penn is retiring from the National Park Service. 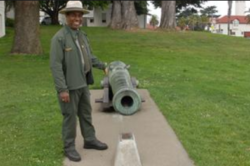 A veteran himself, Ranger Penn will share the unique history of the first black army unit stationed at the Presidio of San Francisco, drawing connections between the past and the present. Historic Buffalo Soldiers Walk, starting at the Officers’ Club and led by Ranger Frederik “Rik” Penn to the San Francisco National Cemetery.